A web-based survey tool is helping IT shops monitor their performance on campus. Open source vendors can save money, but ask the right questions up front to avoid surprises. 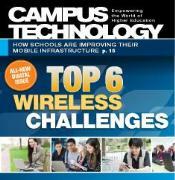 Distributed antenna systems offer a way to improve cellular service, even in problematic corners of campus. With faculty balking at the price of academic journals, can other digital publishing options get traction? CT looks at three ways schools are training the next generation of tech employees. Reading on an iPad or Android tablet? Click here to access the PDF edition of the magazine. An app is in currently in development for iPad/iOS.